We found an amazing wood worker who lives here in Chino Valley and owns a shop in Prescott, Arizona. They make beautiful furniture and cabinets. Jerri was on a mission to find someone to build cheese presses for Homesteader’s Supply. 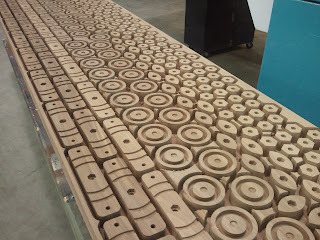 This gave us control over the wood type, control over the quality and consistency we expected from a cheese press. We moved away from pine and into a hardwood in the Mahogany family. It’s naturally resistant to bacteria and washes up nicely with simple soap and water. We had it finished with 100% Tung Oil which is FDA approved for food contact. 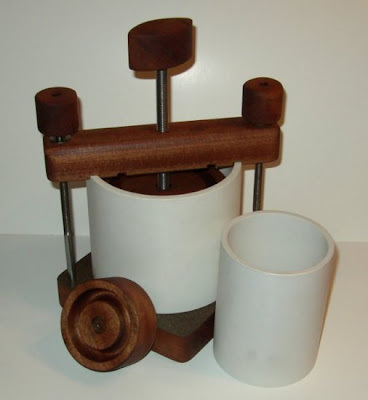 So, what’s involved in making the cheese presses? 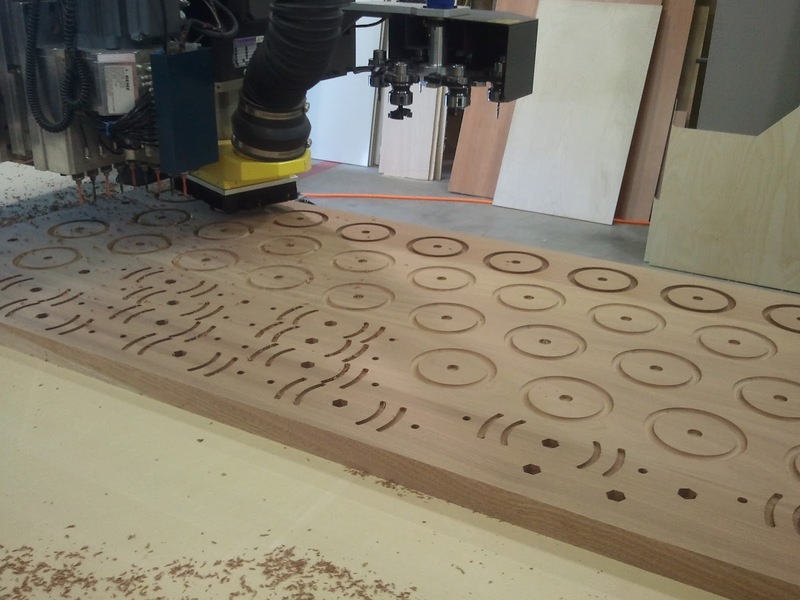 This big plate of wood took six hours to cut. The grooves were added to the bar that holds the hoops in place to keep the hoops from slipping off to the side when tightening down the follower. 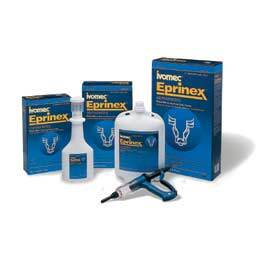 The knobs were designed to be easy to grip and clean. The followers were given grooves for gripping when needing to pull it out of the follower. All of these designs were developed over time when testing prototypes. It was actually a very fun process!!! After six hours, the parts were ready to be sanded free from the small bit of wood that secured them to the slab. Once they are all free, they are sanded and oiled with three coats of Tung Oil. with plenty of drying time in between. Finally the stainless steel hardware is added and the hoops are cut and sanded until ultimately….. You have the Homesteader’s Supply Ultimate Cheese Press!!!! This entry was posted in Cheese Making, Dairy Uses, Homesteading, How-To, Recipes on April 26, 2012 by Homesteader's Supply. 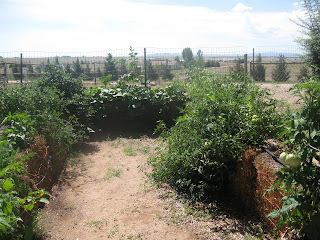 I notice that this time of year folks start thinking about the garden… I notice the hits on the previous straw bale gardening articles goes way up and also noticed that they are a little short on photographs of the process. 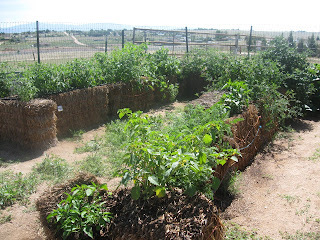 In this blog I will document in words and photos the garden from 2010 where I planted in bales of straw. 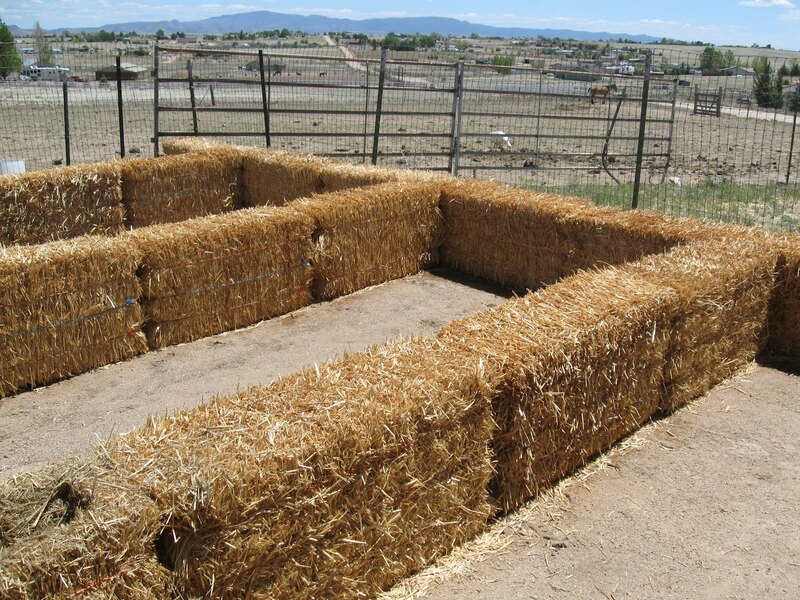 I went up to the feed store and picked out 20 straw bales. I arranged them in the pattern you see below. Knowing now what I didn’t know then… I’d lay them down on their side instead of standing them up like I did. They become a bit top heavy with plants growing up and holding fruits. 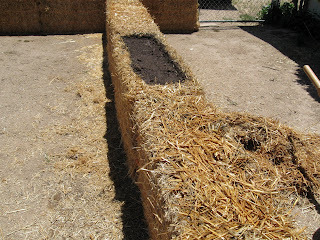 Next, I began the composting process. The recipe I found online called for one cup of 30-0-0 Ammonium Phosphate per bale on day one and 1/4 cup of the same fertilizer each day for 9 more days, followed by a good soaking with the hose. I could NOT find Ammonium Phosphate at any garden store so I settled for Sodium Phosphate (21-0-0) and it did the job just fine. 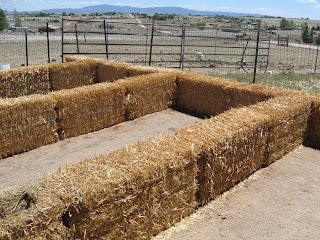 Notice how much darker the sides of the bales are after 10 days of cooking. The insides of the bales have broken down a bit and are soggy and warm. 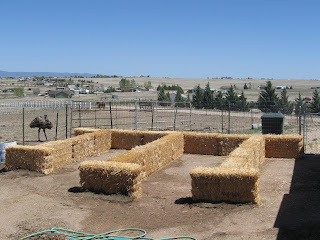 I took a few of the bales and cut out V grooves in there or dirt and plants… this was completely unnecessary and just bound up my chainsaw… Using a claw gardening tool made a big enough hole for the plant and some added growing material (compost). Again, the pulling out of straw below isn’t needed, just a coffee can size hole where your plant will live or sprinkle seeds on top of the bale and cover with dirt and straw works fine too. Below is where I added soil to the V shapes I cut out. After I planted in the bale, I covered with some of the loose straw and soaked well..
Now it’s finally taking form!!! 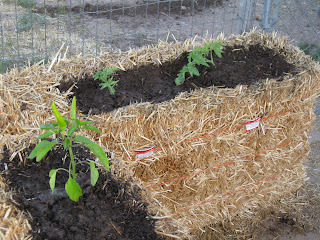 See the happy pepper plants spreading out their roots in their new home! As you’ll see in the photos below it was a very successful adventure. 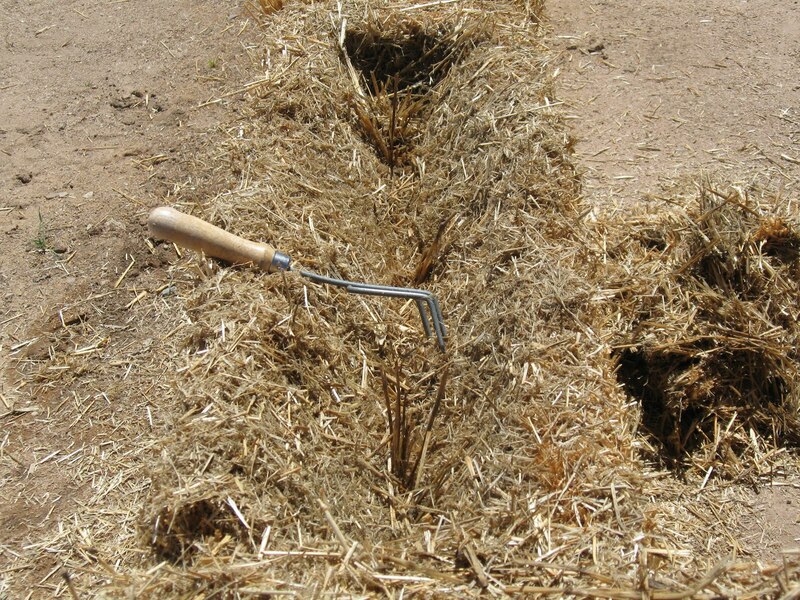 As I said above, if I do this again, I’d turn the bales on the side for added stability. You can see below that some of the bales aren’t doing so well with top heavy plants. The cucumbers were alone the fence in the back for climbing. Peas and green beans didn’t do well in this growing medium… they are nitrogen fixers and in an already nitrogen rich environment, I didn’t enjoy very many peas. Lettuce, cucumber, tomitillo, cilantro, carrots, tomatoes, peppers all did very well. This entry was posted in Homesteading, How-To, Straw Bale Gardening on April 9, 2012 by Homesteader's Supply.